As Winter approaches the clocks go back an hour marking shorter days and the start of long dark nights brings out an ingrained need in us to batten down the hatches and stay cosy in front of a roaring fire. This change of season also marks the launch of my latest product, stunning artisan glass lamps. 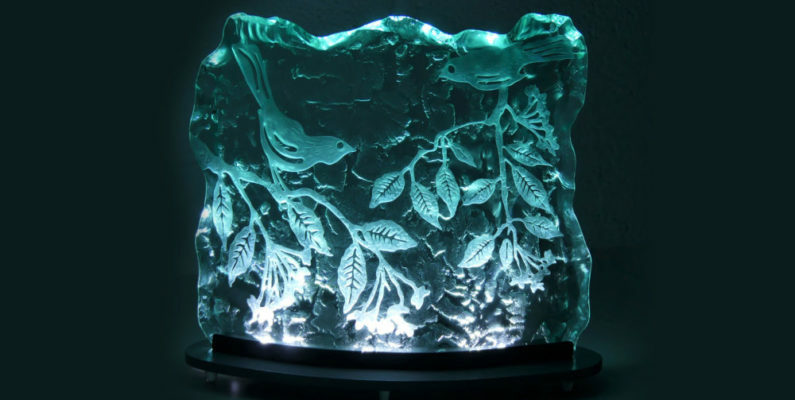 These beautifully handcrafted interior lights feature glass etched designs inspired by nature on a solid base. These unique table lamps will bring a soft subtle glow to your room on a cold winters’ night. I am constantly inspired by the natural world and am lucky enough to have a constantly changing living ‘mood board’ in the view from my studio in the stunningly beautiful Rutland countryside. By crafting each lamp by hand I can ensure they are all of the highest quality and unique in design. Inspired by flora and fauna, I like to use techniques and mediums to complement this such as slate and wood for their natural textures and tactile properties, and glass for its light reflecting qualities. A solid wooden base is topped with a thick panel of sand blasted etched glass featuring naturalistic designs, each piece offering unique examples of art on glass. Illuminating the design from the base really highlights the intricate detail of each piece and gives an almost 3D effect to the image. I prefer to work with the unique characteristics of the wood and let this natural features of this medium enhance the finished piece. By hand selecting pieces with interesting grain patterns I can make a feature of any knots, burrs and pips within the wood adding interest and texture to the bases I hand craft using this beautiful timber. Drawing on many years’ experience of working with glass I use a variety of techniques and processes to bring out the natural beauty of this versatile medium. Transparent textures are enhanced by refraction, the bending of light as it passes through the glass and out into the air. With this in mind, I have designed the lamp to illuminate up from the base and through the glass panel to reflect off cut edges of the etched image which highlights the intricate details such as the feathered effect of the leaves and curled fronds of the fern. The light strength is stronger at the base of the glass panel allowing interesting details such as twisted roots and the textures found on tree bark to be more prominent. A more contemporary twist to this style of light is the ‘ice effect’ of the curved lamp which has a metallic base and is perhaps more suited to minimalist interiors. The refraction from the light source in the base picks out patterns by throwing shadows and sparkling light. Even during daylight hours when these lamps are switched off the sunlight in a bright room will continue to highlight unique abstract textures within the glass work, providing an ever changing piece of glass art. True to my aesthetic design roots, these lamps are both beautiful and functional. Other designs include thistles, seed heads, leaves and birds. 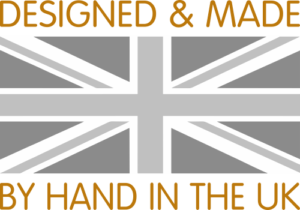 I’m also happy to discuss individual requirements and create a bespoke lamp to suit different styles and budgets. So, no need to be stuck for Christmas present inspiration for that special person in your life. Keep following the blog for updates on other new product launches.